The week of October 22nd was quite a week for concerts. First, Lori and I caught up with Iris DeMent in Annapolis, and later in the week my friend Phil treated me to my first concert at Anthem. Anthem, the 9:30 Club’s “big brother,” can accommodate up to 6,000 people, and amazingly it looked like nearly that many people had shown up for the show. 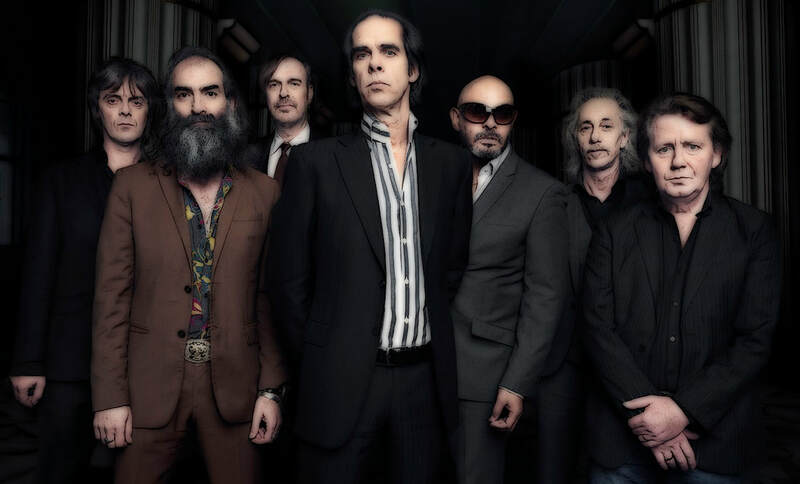 I say “amazing” because although Nick Cave and the Bad Seeds are prolific and entertaining, they have never struck me as the kind of band that fosters mass appeal. They are often abrasive, alarmingly aggressive and very, very dark. Their most popular album to date (and in fact the only one I owned up until a few weeks ago) is titled The Murder Ballads, and the narrative of every song on it details one grisly demise after another. Although their contributions to the soundtrack of the Netflix series, Peaky Blinders, has undoubtedly won them some new followers, I was still pleasantly surprised to see such a large turn out for such an enigmatic and legendary band that even I admit a woeful (and dare I say, inexcusable?) unfamiliarity with. After witnessing their amazing performance the other night, referring to Nick Cave and the Bad Seeds as a “band” feels somewhat inadequate. They are a tight, ensemble of multi-instrumentalists lead by a sharply dressed whirling dervish with a baritone whose youthful gymnastics are either indicative of a diabolical deal done with the devil down at the rock n’ roll crossroads or unlawful access to the fountain of youth. Despite his macabre appearance, Cave prances and leaps about the stage with Jagger-like flair. He also has a penchant for making personal contact with as many members of the audience as he possibly can — or at least employ them to hold his microphone while he gyrates around the stage urging on his bandmates. Even Bono and Bruce would be jealous. Again, I was expecting aloof and caustic from this 35 year-old Melbourne, Australia band, not the kind of warm and fuzzy that ends the show with a deliriously chaotic congregation of fans invited up on stage to cavort amongst the band’s frenzied thrashings. The night was full of surprises like that. Cave is a fascinating artist who appears to be equal parts sacred and profane; a sinister prophet spewing poetic verse laden with gruesome imagery, religious symbolism, and literary references. Bathed in blood-red or stark white light, the Bad Seeds could easily be mistaken for a group of somber morticians if it weren’t for their incomparable musicianship and fiercely energetic efforts to entertain. This is no run-of-the-mill post-punk pop band eking out a few more half-hearted performances just to pad their retirement portfolio. This is a musical juggernaut brimming with complex compositions, beautiful ballads, cinematic instrumentals, and even anthemic fist-pumping rockers. It’s a band that shows no sign of slowing down or running out of musical ideas to explore. I don’t know why it’s taken me so long to experience the music of Nick Cave and the Bad Seeds and appreciate all they have to offer, but I am certainly grateful Phil suggested we go see them at Anthem a few weeks ago so I could finally start. Choosing just one representative recording for the Happy Medium Song of the Day is damn near impossible, but I’m gonna go with one of the band’s more introspective and tuneful compositions that first appeared on the 1997 album, The Boatman’s Call and has since been re-released on the indispensable collection, Lovely Creatures: The Best of Nick Cave and The Bad Seeds. “Into My Arms” offers more soul-searching and redemption than bloodletting and mayhem, but that’s what makes it a gentler introduction, dear reader, and perfect for the Happy Medium Song of the Day.